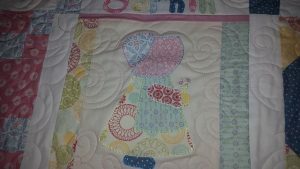 My latest customer quilt was this adorable sampler quilt by Laura Dixon. 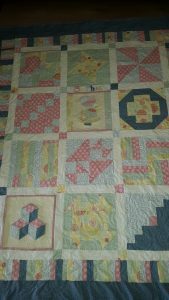 She took a beginner quilting class in St Colmcille’s Adult Education, knocklyon by teacher Deirdre Carroll. 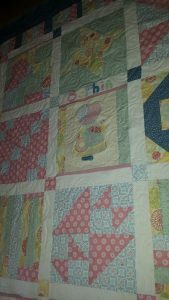 I think a lot of hard work went into this quilt and you can understand why Laura came to me to quilt it for her, as it is not something you learn to do with beginner quilting, the quilting bit! That is a whole other ball game right! 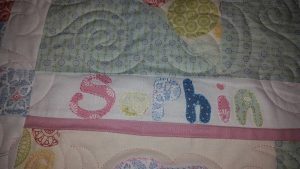 I was also surprised to see applique and even some phlange piecing in this quilt. There were also cornerstones which I still find difficult to do myself. I think she caught the quilting bug but she may have to find someone to teach her free motion quilting or I’m sure I will be seeing Laura again. I did a swirl hook design with a pale pink thread and it turned out fantastic, and compliments the cute backing with all those colourful sheep. I’d say it will stay many years on her daughters bed.